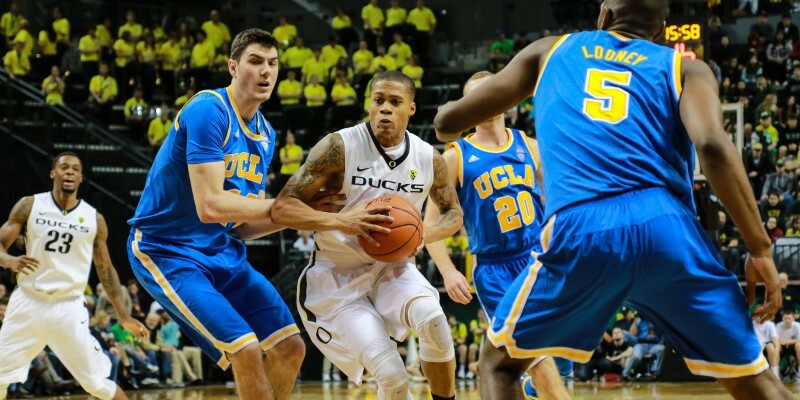 The Oregon Ducks men’s basketball team matched up against Steve Alford and the UCLA Bruins at Pauley Pavilion on Saturday afternoon, and came up short in a 72-63 loss. With only about two weeks remaining in the regular season, both the Ducks and the Bruins came into Saturday’s game on a hot streak. After getting off to a slow start earlier in the season, UCLA regained some of its swagger in recent weeks, winning four out its last five games, and positioning itself for a strong finish. Oregon found itself in similar territory. The Ducks entered Saturday’s matchup winning six out of their last seven games, and sitting only two games out of first place in the Pac-12 standings. The Bruins’ (16-10, 8-5 Pac-12) scorching start at the beginning of the game resembled the warm weather that the City of Los Angeles has enjoyed in recent weeks. UCLA attacked the basket relentlessly and made four out of its first five shots. The Ducks (18-8, 8-5 Pac-12), however, couldn’t get off a clean shot, thanks to the Bruins’ defense. UCLA’s interior size made it extremely difficult for the Ducks to establish an offensive rhythm, and Oregon missed three out of its first four shot attempts, which culminated in a 10-2 UCLA run. After a quick Dana Altman timeout, things changed. Oregon walked out of the huddle focused, and put up a quick 10-2 run of its own, tying the game at 12 and reversing the momentum. The Ducks kept the Bruins on their heels as they pushed the ball in transition, which disallowed UCLA from setting up its half court defense. Oregon’s attack on the offensive end wasn’t spearheaded by Joseph Young, however. Senior guard Jalil Abdul-Bassit connected on his first four shots, which gave him 12 quick points, and the Ducks led 20-14 midway through the first half. The offensive production didn’t stop there, though. Norman Powell and Kevon Looney led the Bruins, and UCLA countered Oregon’s 18-4 run with a late 8-0 run to reclaim the lead. Both teams shot the ball extremely well in the first half, as the Ducks and the Bruins combined to score 81 points. UCLA came out of the locker room with a 41-40 advantage, and much like the beginning of the game, the Bruins’ defensive intensity to start the second frame rattled the young Ducks. The open lanes that Young was attacking during the first 20 minutes, which created open opportunities for his teammates, were no longer there, and the Bruins’ ability to defend Oregon’s pick and roll was paramount. Despite UCLA’s start on the defensive end, the Ducks countered that by playing hardnosed defense, as well. The Bruins missed six out of their first nine shots and they held a narrow 60-56 lead midway through the second half. The wheels fell off for the Ducks late in the second frame, however. The Bruins’ size and physicality overmatched Oregon’s defense, which led to 34 points in the paint, and Powell’s dribble penetration created free-throw opportunities for his teammates. After scoring 40 points in the first half, the Ducks only put up 23 points during the last 20 minutes and their shooting percentage dipped to 39%. Despite the loss, Oregon remains in third place in the Pac-12 standings, and with five games left on the regular season schedule, including three road games, the Ducks will have to show just how much they’ve grown up this year. Oregon will host Colorado next Wednesday night at Matthew Knight Arena.